The success probability in an ancilla-based circuit generally decreases exponentially in the number of qubits consisted in the ancilla. Although the probability can be amplified through the amplitude amplification process, the input dependence of the amplitude amplification makes difficult to sequentially combine two or more ancilla-based circuits. A new version of the amplitude amplification known as the oblivious amplitude amplification runs independently of the input to the system register. This allows us to sequentially combine two or more ancilla-based circuits. However, this type of the amplification only works when the considered system is unitary or non-unitary but somehow close to a unitary. In this paper, we present a general framework to simulate non-unitary processes on ancilla-based quantum circuits in which the success probability is maximized by using the oblivious amplitude amplification. In particular, we show how to extend a non-unitary matrix to an almost unitary matrix. We then employ the extended matrix by using an ancilla-based circuit design along with the oblivious amplitude amplification. Measuring the distance of the produced matrix to the closest unitary matrix, a lower bound for the fidelity of the final state obtained from the oblivious amplitude amplification process is presented. Numerical simulations for random matrices of different sizes show that independent of the system size, the final amplified probabilities are generally around 0.75 and the fidelity of the final state is mostly high and around 0.95. Furthermore, we discuss the complexity analysis and show that combining two such ancilla-based circuits, a matrix product can be implemented. 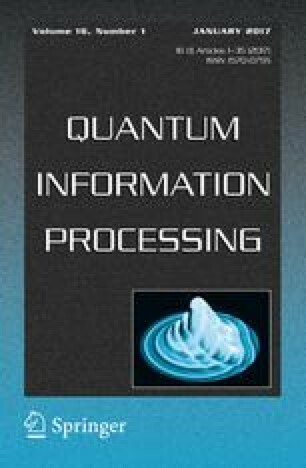 This may lead us to efficiently implement matrix functions represented as infinite matrix products on quantum computers.